We receive a lot of questions about the ProSkill scores on our Race Results. In this post, we will try to answer a few of the most common questions. At the beginning of the year, each racer begins with 1,200 ProSkill points. Each racer adds 5 ProSkill points to the overall total when he races and will gain or lose ProSkill points every race. 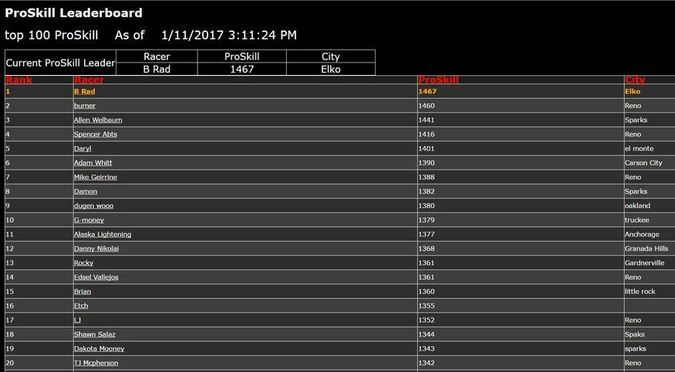 Notice that the total amount of ProSkill increased by 25 points (45+25+5-15-35=25) due to 5 racers competing in the race. Since each racer started the race with equal ProSkill, the distribution of ProSkill for the race was straight-forward with the winner gaining 40 points plus the 5 for entering the race, second gained 20 points plus 5 for entering the race, third did not win or lose points in the race but gained 5 points for competing, and so on. Once again, the total amount of ProSkill increased by 25 points (43+24+3-13-32=25) due to 5 racers competing in the race. Racer B now has the highest ProSkill total, which is expected due to finishes of 2nd and 1st. Racer A actually lost 2 points for finishing third (which was offset by the 5 points gained by racing) and now has the second highest ProSkill total after finishes of 1st and 3rd. Racer C gained points, but remains behind Racers A and B with finishes of 3rd and 2nd. Finally, racers D and E lost fewer points this race due to their previous results predicting that they would not beat the other three racers. In summary, your ProSkill score is an aggregate measure of how often you race, your finishing position, and the strength of your competition on the track.